Microsoft continues to change the Windows 10 Settings These Windows 10 Features Are Constantly Changing These Windows 10 Features Are Constantly Changing Windows 10 will never stop changing. Microsoft is constantly experimenting. Here are some Windows features that continue to improve with every Windows update. Read More with each release, eventually aiming to phase out the Control Panel Why Microsoft Is Killing the Windows Control Panel Why Microsoft Is Killing the Windows Control Panel The Control Panel is being decommissioned. In Windows 10, the Settings app has adopted most of its features in a more stylish and mobile-friendly interface. Is that really necessary? Read More . With the Fall Creators Update, we’re going to take a look to see what new Settings features are available. From brand new functions like pairing your phone or customizing video playback, to improvements on existing ones like Gaming and Windows Update, Settings has seen some great improvements. If you’re looking to upgrade, see our article on things to do before installing the Fall Creators Update Do This Before Every Windows 10 Update or Installation Do This Before Every Windows 10 Update or Installation Windows 10 gets major updates twice a year, plus monthly updates. We show you what you should do before running Windows Update. Now Patch Tuesday can come! Read More . If we’ve missed anything that you think is worth pointing out, head to the comments section and let us know. Quick Tip: You can easily access Settings at any time by pressing Windows key + I. 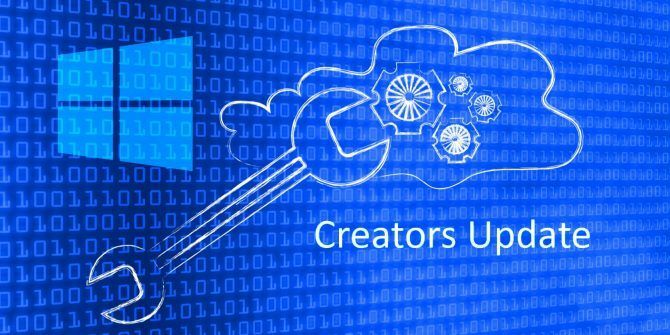 Below we’ve listed some new features of the two most recent Creators Updates, along with where to find them on the Settings overview page. Storage Sense was a new feature in the Creators Update, but some new options have been added. Access it via System > Storage > Change how we free up space. You can now enable Delete files in the Downloads folder that haven’t been changed in 30 days and also Delete previous versions of Windows. The latter is used after an upgrade to Windows 10, though note that these will be cleared automatically after 10 days whether you’re using Storage Sense How to Save Disk Space in Windows 10 How to Save Disk Space in Windows 10 In terms of disk space requirements, Windows 10 is downright gluttonous. Wasting 20 GB on a small SSD can be frustrating. Fortunately, you can reduce the Windows 10 footprint and reclaim some of that space. Read More or not. The new Phone section allows you to link your iPhone or Android phone to your Windows 10 PC. Click Add a phone to get started and follow the wizard. You’ll need to verify your phone number and download the app it sends you. This feature is still in its infancy. Currently, you can use your phone’s share feature to select Continue on PC. This will then send the supported content, like a website link, straight to your PC. If you’re on Android then you can also use the Microsoft Launcher, which will reskin your phone. Swipe right to get a feed of events, news, and favorite apps. The Microsoft Launcher is better than what Windows Mobile used to offer, but I still prefer stock Android. The Phone feature will undoubtedly be improved in future Windows 10 updates. Previously, Microsoft talked about receiving incoming call alerts and a Timeline tool to load up previously launched apps. Sadly, these didn’t make the Fall Creators Update. You may have noticed the new icon on your Taskbar, near the tray. This represents the People feature and lets you pin contacts to your Taskbar for quick access. You can click the icon in your Taskbar to get going. It hooks into applications like Mail and Skype, though you can also add friends and family manually to the People application itself. To edit its behavior, go to Personalization > Taskbar and scroll to the People section. You can turn it off entirely with the Show contacts on the taskbar or customize notification settings with Show My People notifications and Play a sound when a My People notification arrives. Some applications, like Edge, Movies & TV, and Netflix, use Windows 10’s video platform. You can now customize the settings for this by going to Apps > Video playback. If your monitor supports High Dynamic Range (HDR) The Best Affordable 4K HDR Smart TVs You Can Buy The Best Affordable 4K HDR Smart TVs You Can Buy Those in the market for a new Smart TV have a tough choice to make. It's not a gadget that you upgrade often, so you want something future-proof. So, what do you get? Read More , you can slide Stream HDR Video to On to get the most out of it. You can also choose to allow Windows to Automatically process video to enhance it and Allow video to play at a lower resolution for those needing to save bandwidth. Found via Accounts > Sign-in options, beneath Privacy, you’ll find a new toggle called Use my sign-in info to automatically finish setting up my device after an update or restart. This is turned On by default. After an update to Windows or a supported app, where your system has to restart or shut down, it’ll automatically sign you in so that it can complete the process. Once done, it’ll then log you out. The Gaming section of Settings was introduced in the previous Creators Update, but some new abilities have been added. In Game DVR, you can now choose to Record game audio only. Similarly, in Broadcasting you can Broadcast game audio only. This means it won’t pick up things like your voice or system sounds when recording or streaming. TruePlay is a new feature, though in typical Windows 10 fashion it doesn’t properly explain what this does. Essentially, it’s Microsoft’s anti-cheat tool. Supported games will run in a protected process to mitigate against attacks. The game will also be monitored for cheating, with that data then analyzed and sent to the developers if a cheat is found. Elsewhere, the Xbox Networking page gives you information about your connection status, performance (latency and packet loss) How to Optimize Windows 10 for Gaming and Performance How to Optimize Windows 10 for Gaming and Performance Are you gaming on Windows 10? You can optimize Windows 10 for gaming with Game Mode and other tips and tweaks. We show you how. Read More , and Xbox Live multiplayer compatibility (NAT type and server connectivity). If problems are found, you can click Fix it to try and automatically resolve them. A few of the tools in the Ease of Access section received new features. First, Magnifier now gives you the choice to Invert colors and Enable bitmap smoothing. This latter option aims to make things look clearer when zoomed in at a high level. You’ll also find a list of keyboard shortcuts for controlling the Magnifier. Click Show all keyboard shortcuts to expand the list. Second, Ease of Access > Color & high contrast used to just be called High contrast. Those settings are still here, but there’s now the addition of Color filters. These help those with color sensitivity or color blindness to see the screen more clearly. Slide Apply color filter to On to enable it. You can then use the Choose a filter drop#down to change between options like Greyscale, Invert, and Deuteranopia. All the Cortana settings are now grouped together in Settings. Cortana > Talk to Cortana lets you set how Cortana is activated Hey, Cortana? Everything You Didn't Know to Ask and More Hey, Cortana? Everything You Didn't Know to Ask and More Cortana can do a lot more than you think. This master list of basic and not-so-obvious commands will help you get to know your virtual assistant and increase your productivity. Read More , whether through speech, a keyboard shortcut, or the lock screen. Permissions & History collects together what Cortana is allowed to manage on your behalf. A new setting here is Windows Cloud Search, which you can switch On or Off to determine whether your cloud content is shown in Windows Search. You can also click Manage the information Cortana can access from this device to be taken to a different page. Here you can change the Location, Contacts, email, calendar and communication history, and Browsing history permission settings. Going back, Cortana > Notifications gives you the option to enable Send notifications between devices. This will mean Cortana will tell you when your phone’s battery is low, or if you miss a notification. Those with limited bandwidth will be pleased to know that this update adds greater fidelity for Windows updates Windows Updates Are Set to Get Less Annoying Windows Updates Are Set to Get Less Annoying Under the new system, Windows 10 updates should be smaller in size, be downloaded more efficiently, and put less strain on your system resources. A change you probably won't even notice. Read More . Go to Update & Security > Advanced options > Delivery Optimization > Advanced options. Here you can limit what percentage of your bandwidth is used for downloading updates. The sliders only offer 5% as the lowest, so you can’t entirely block the updates. If you’ve opted in to upload Windows updates to other computers, you can also set the bandwidth percentage for this. Additionally, you can set a monthly upload limit, which once reached will stop your device uploading to other PCs. Windows changes quickly these days. Curious what changes the previous Windows Update brought? Here are the most important settings that were new to you when you upgraded from the Anniversary Update. Third-party apps like F.lux have been around for a while, claiming to help improve your sleep habits Can F.lux and Night Shift Really Improve Your Sleep Habits? Can F.lux and Night Shift Really Improve Your Sleep Habits? Excessive use of computers, tablets, and smartphones can lead to deteriorated sleep quality -- but do apps like F.lux and Night Shift really counteract those effects? The science is pretty clear on this. Read More . Now Microsoft has integrated the feature into Windows 10. Accessible via System > Display > Night light settings, the Night Light functionality Reduce Eye Strain and Sleep Better With This New Windows 10 Feature Reduce Eye Strain and Sleep Better With This New Windows 10 Feature In the Windows 10 Creators Update, you don't have to use a separate app to filter blue light at night. Here's how to turn on Night Light and save your eyes some trouble. Read More will change the color temperature of your screen. Click Turn on now and use the slider to adjust to your liking. You can set your own levels or schedule it to your local sunset by sliding Schedule night light to On. If you find yourself often struggling for free storage space How to Free Up Storage Space to Run Windows 10 How to Free Up Storage Space to Run Windows 10 Did you run out of space for Windows 10, but want to upgrade or add more apps and data? We have compiled resources that will help you free up disk space on and for Windows... Read More , or just want to keep things tidy, you’ll like the new Storage Sense feature. Find it in System > Storage. Beneath Storage sense, slide to On to enable the feature. Then click Change how we free up space. Here you can choose to enable and disable particular functions. At the moment it only deletes temporary files that apps aren’t using and files in the recycle bin for more than 30 days, but let’s hope it expands in a future update. This feature launched with the Anniversary Update; you could begin a task on one device and continue on another. It originally only supported Microsoft devices but has now been extended to Android too, though the number of developers supporting it is minimal at the moment. It’s enabled by default on System > Shared experiences and here you can also choose who you share or receive from. My devices only is more limited, while Everyone nearby will allow those in the vicinity to connect to your computer. This isn’t an entirely new feature per se, but the Creators Update has given it an improved interface and the nice ability to easily save your theme and switch between custom ones. To get started, head to Personalization > Themes. Here you can click elements like Background and Sounds to customize them. Once satisfied, click Save theme to do exactly that. You can also click Get more themes in the Store to browse the growing collection of downloadable themes. You can now choose where you download apps from. Microsoft claims that installing only apps from their official Windows Store The Best Windows 10 Apps The Best Windows 10 Apps Windows 10 Store apps have come a long way. Meanwhile, you can choose from a considerable selection, free and paid. We have picked out the ones worth your while. Read More will keep it running smoothly. This feature is likely most useful for those of you with multiple people using your computer. To adjust this setting, go to Apps > Apps & features and use the Installing apps dropdown. Allow apps from anywhere is the default, but you can also switch to Warn me before installing apps from outside the Store and Allow apps from the Store only. Dynamic Lock is a feature that will automatically lock your computer The 6 Best Methods to Lock Your Windows PC The 6 Best Methods to Lock Your Windows PC Locking your computer is essential in preventing unattended access. Here are several great ways to do so in any version of Windows. Read More when it detects that your phone has moved away from it. To get started, go to Devices > Bluetooth & other devices and then click Add Bluetooth or other device to pair your phone. When done, go back to Settings and go to Accounts > Sign-in options and tick Allow Windows to detect when you’re away and automatically lock the device. The Gaming section is brand new and has a whole host of customizable features. Some of this was available in the Xbox app previously, but now it’s more easily accessible via Settings. Game Bar allows you to enable the in-game overlay, along with changing the keyboard shortcuts to perform certain actions like taking a screenshot or turning your microphone on and off. Note, however, that the Game Bar can slow down your system Fix Low Game FPS in Windows 10 by Disabling This Feature Fix Low Game FPS in Windows 10 by Disabling This Feature There's a new feature in Windows 10 that could be having a significant impact on your gaming performance. Here's how to disable it. Read More . If you’re struggling with performance issues, try to disable this feature. Game DVR lets you turn on background recording so that you never miss a great gaming moment, along with the ability to change how long this runs for and the capture quality. Finally, Game Mode lets you enable the self-titled feature, which supposedly helps improve your game performance. We’ve tested Game Mode to analyze those claims Can Windows 10 Game Mode Boost Performance? We Tested It! Can Windows 10 Game Mode Boost Performance? We Tested It! Can Windows 10 increase the performance of your games? Microsoft promises to increase gaming speeds and boost FPS with its new Game Mode. We tested how well it works. Read More , so check that out to decide if you want to use it. Accessible via Update & security, some of the functionality here has been tweaked. If you use active hours, which stops your system restarting during a specific time period, you can now specify a range of up to 18 hours. If you click Restart options you can also choose to Show more notifications so you get a warning that the system is about to restart. Finally, there’s a great new Troubleshoot section which will help you resolve all sorts of issues that you might be having with your system, like blue screens or network problems. Click the relevant troubleshooter and it’ll launch to try and automatically fix any issues. Windows 10 is an ever-evolving operating system 5 Windows 10 Features You Should Stop Using Soon 5 Windows 10 Features You Should Stop Using Soon Microsoft is cleaning up! Many Windows features will be removed or deprecated. See which key features you should replace before your next Windows upgrade. Read More and the Settings pages are going to keep changing. It’s a good idea to check in after every big update to see what new stuff is available. For more information, check out our ultimate guide to controlling Windows 10 via Settings How to Control Windows 10: The Settings Guide How to Control Windows 10: The Settings Guide The Windows control panel is on its way out. Its replacement, the Settings app, has received a significant upgrade in Windows 10. We'll reveal all its secrets for you. Read More , which goes into full detail on every section. What is your favorite new Settings feature? Is there something you’d like to see Microsoft add? Explore more about: Computer Maintenance, Windows 10, Windows Update. For myself the weaker the hardware the worse this update is. Apparently more throttling of CPU is going on to save battery on laptops. My core i3 Skylake is definitely slower then Creator now. By default its supposed to be balanced and have a "slider" to adjust performance. I don't see any slider option? Also lost all other power profiles in Power settings Control Panel. Also my desktop PC has major pauses with wireless mouse when PC is loading web pages or doing significant background tasks. The mouse cursor just freezes momentarily until system catches up. Very annoying and have not found a solution as yet to it. Frankly I am just tired of being forced onto to these updates that are still basically a beta being fixed as we go. Kind of like a out of tune engines that you praise you got it running but it still needs a lot of tuning. None of the new features even interest me, and especially not now that my PC runs worse. I would not be surprised if Microsoft completely abandons Windows as a service by 2020. Who in their right mind would embrace such a broken upgrade cycle that every six months you cringe on what's going to break this time? Yes my Core2 Duo laptop is also slower! Not many people actually notice the downsides. If I am trying to eliminate as much of the "Blue" light, (The light that interferes with sleep. ), as possible which way do I slide the scale? New features are all well and good but there are still loads of things that need tweaking, things like windows 10 and skype when it come to audio volume. More time on sorting the bugs please. I am from India where internet connectivity is slow. in windows 10 it auto update feature auto update any time so my youtube video run's in low resolution . is there any way to freeze or stop auto update it will big help for me. Easy! click on the windows icon or use the windows key, type services, click on the desktop app when displayed, scroll down to Windows update, right-click the service and click on stop, you can restart when you want. In this update, they removed Display and Personalization from the Control Panel and moved it to settings. Microsoft is very slow in moving everything from Control Panel to Settings. I like Control Panel better.